According to Lopes, this seems like a minor issue. However, Utley has not been productive for a long time now. In the entire month of June, Utley has just 9 hits in 49 at-bats with 2 RBI, no homers and only 2 extra-base hits, both doubles. These numbers are not typical of a healthy Utley, but he constantly insists that he is healthy when questioned. Hiding an injury is not new for Utley; his hip problem in 2008 which required off-season surgery was also not disclosed until then GM Pat Gillick let the cat out of the bag during an interview. The same has happened again, only with Lopes as the loose-lipped culprit. This begs the question, is Utley’s issue more serious than anyone knows and is he hurting the team by continuing to play? If some time-off will help, he should take the time off and get himself straight. While Utley’s tough-guy, play at all costs mentality is admirable, it is also not helping his team. And the cloak and dagger technique used trying to hide the issue does nothing but prompt more questions and speculation. According to CSN Philly’s Jim Salisbury, GM Ruben Amaro Jr. said, “Davey Lopes is not a doctor,” and was quite upset about the comment. Although, Amaro did admit to Utley having “soreness” in the knee, but not a full-fledged injury. Yes, ball players get “sore” throughout the season. So again, why all the cloak and dagger when this is a common occurrence among ball players? I am not a doctor either, but I am fairly certain that if a bear stops eating, something is wrong. 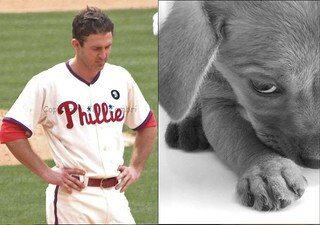 Bears like to eat; Utley likes to hit. Right now, it is just not happening. What are your thoughts on the subject? Feel free to chime in below in the comments section. And yet, this off-the-wall foretelling was not the strangest thing to happen today. The Phillies were losing the game 10-3 by the seventh inning stretch. Shane Victorino started the bottom of the 7th by grounding out and it looked like that might me the nail in the coffin for the Phils. Apparently not. 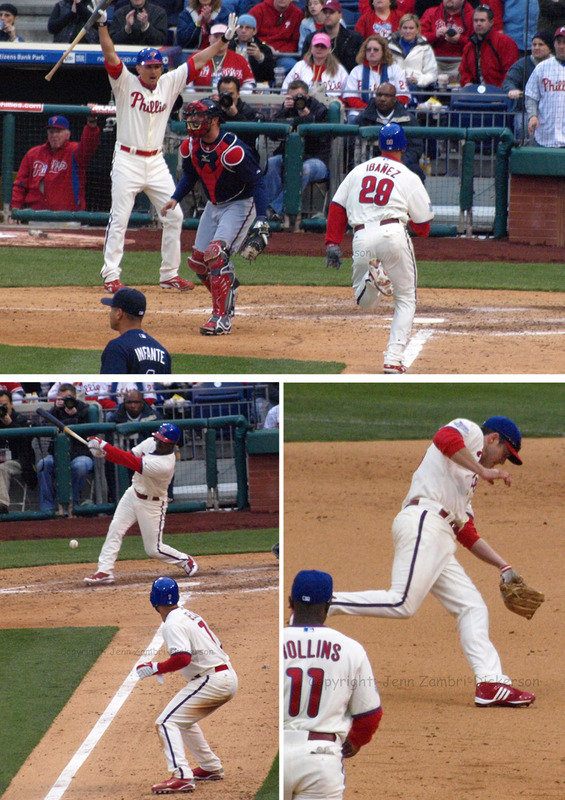 A series of small miracles occurred for the Phillies starting with a Chase Utley bloop single that fell into no-man’s land and then Ryan Howard was hit by a pitch. After that, the weirdest string of event I have even personally witnessed in a game, turned a 10-3 deficit into an 11-10 lead. The Braves bullpen helped out with 5 walks plus the Howard hit-by-pitch; 4 runs scored off those walks. The other 4 runs were the result of 3 singles and a fielder’s choice. The Phillies advanced slowly along the base path in 90 foot increments until all 8 runs were in and the inning ended on a Jayson Werth fly ball. Several words come to mind here: Unbelievable; incredible; mind-boggling; implausible. Call it what you will, but in the end, it is the greatest come from behind victory I have ever had the pleasure to witness. Off day tommorow; Phillies take on the Rockies Friday at 4:10pm EST. Quick recap of the last 2 Spring games: The Phillies beat the Rays yesterday, 3-2, thanks in part to a Jason Donald walk of RBI single. Today, they lost 9-7. Cole Hamels, still rehabbing his sore elbow, pitched 5 innings, allowing 6 hits, 6 runs and a walk. Not a great outing, but he got his work in and should be able to start against the Rockies next week. 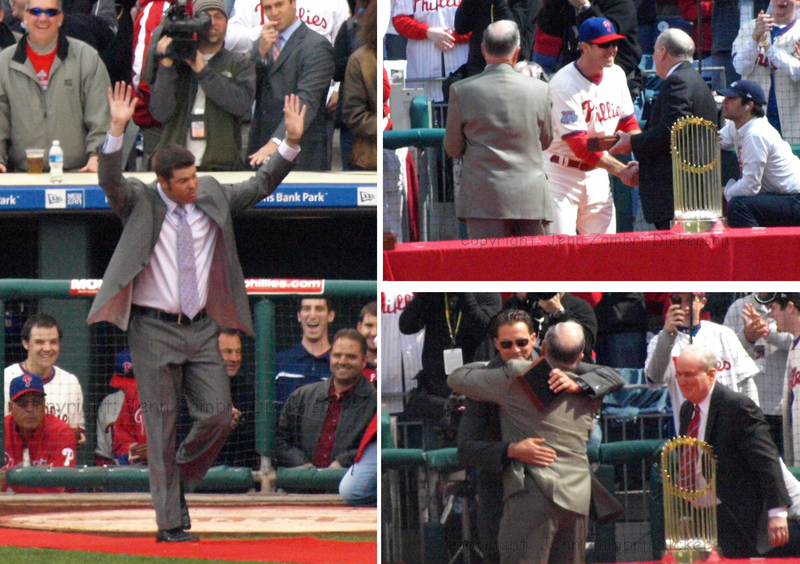 Pat Burrell led the game off for the Rays in his only appearance today, greeting former teammate Hamels with a shot to left field that, even against the strong wind, flew into the seats. A nice exit from Philly for Burrell who was visibly emotional after the rousing applause he received from Phillies fans over the past two days. We will miss him! 7:23 p.m. – Cardinal O’Hara High School marching band will perform as the 2009 Phillies enter the ballpark, greeted by Mayor Nutter and Charlie Manuel. 7:38 p.m. – America the Beautiful will be sung by the Philadelphia Boys Choir and Men’s Chorale, directed by Jeffrey R. Smith, as members of the Pennsylvania Army and Air National Guard unfurl the American Flag. State Flags will be carried onto the field by the Philadelphia Police and Fire Department personnel. 7:53 p.m. – National Anthem: Will be performed by Katie Stam, Miss America 2009. 7:56 p.m. – U.S. Army 82nd Airborne Parachute team will parachute onto the field (weather permitting), bringing the first balls. 8:00 p.m. – NASA astronaut Chris Ferguson, who wore a Phillies jersey in space, will present the jersey to Charlie Manuel. 8:01 p.m. – Ceremonial First Pitch: Will be thrown by former Phillies General Manager Pat Gillick and Ben Lo, representing Modell’s Sporting Goods. 8:09 p.m. – Play Ball! Let me just note a few things here: The Phillies, the reigning WORLD CHAMPIONS, are having the Philadelphia Boys Choir sing America The Beautiful, like they do every year. We will then have Miss America sing the National Anthem; but seriously, should I be excited about a pageant queen? Maybe some of the men are happy, but I just don’t get it. The Boston Red Sox, according to our friend Julia at Julia’s Rants are getting Grammy Award winner, Seal, to sing for them on Opening Day! 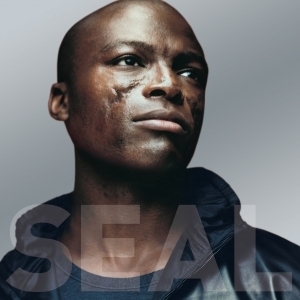 SEAL! 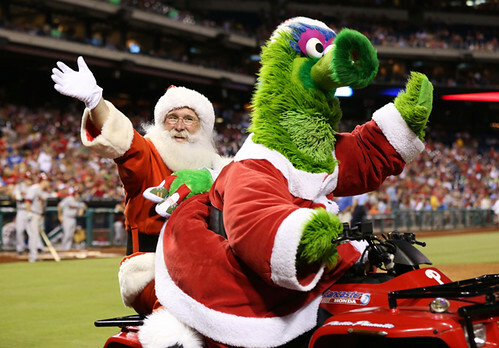 Where, or where, have the Phillies gone wrong?? I am so depressed. 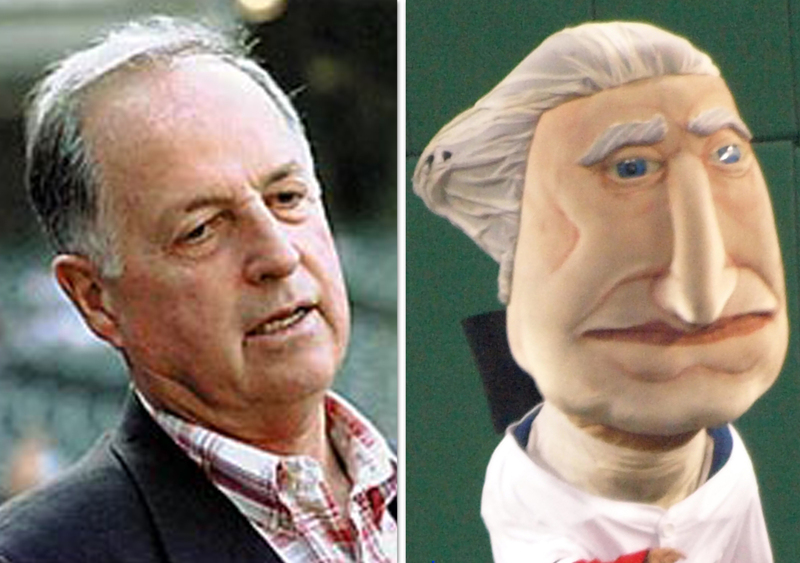 Now let us move on to the first pitch: Former GM, grumpy man and Nationals mascot look-alike, Pat Gillick, will toss the first pitch. Is this seriously the best the WORLD F*@%# CHAMPIONS could do? I had heard rumors all week that maybe President Obama would visit Philly for the occasion, but he will toss the first pitch on Wednesday in DC when the Phillies take on the Nationals in their home opener. But what about Will Smith, who is a huge Phillies fan? Or even Jamie Foxx, who was just in Philly filming a new movie? Heck, I would settle for Patti LaBelle at this point. But noooooo…we get Pat freakin’ Gilick! Don’t get me wrong, I love Grumpy Gillick and all, but this is not exactly a treat for Phillies fans; we see him every day! We want… no, we deserve, a special treat for Opening Day! The Phils had no issue with raising the ticket prices, but could not be bothered to get anyone more interesting to toss a pitch?? Again, Gillick brought us a World Championship, but I think even he would agree that his sheer entertainment value is a tad less than Seal. UGH! Ok, maybe I am over-reacting. You know how we redheads get sometimes. But take a look at a few other teams, who did NOT win the World Series, and see what they are doing for Opening Day: Both the Yankees and the SF Giants have HERO Chesley “Sully” Sullenberger, the pilot who successfully landed a plane in New York’s Hudson River this past January, saving the lives of everyone on board, to toss their first pitch. The Reds have musician and former husband of Jessica Simpson, Nick Lachey to throw their first pitch. And they are in OHIO, folks! That’s right, Ohio out-did Philly. The Houston Astros have 4-time Grammy winner, Lyle Lovett, to sing the National Anthem. 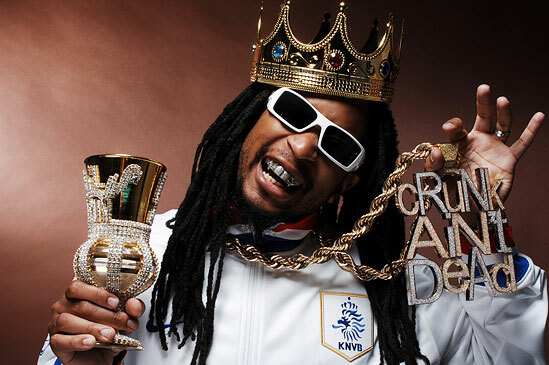 And of course, the Nats get the Prez. Okay, I think you get the picture. 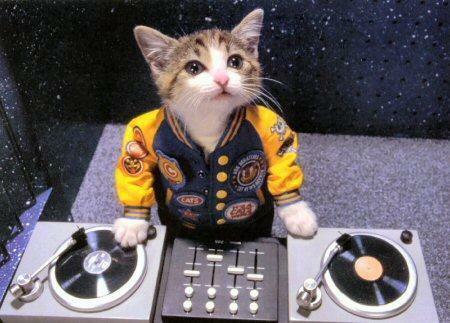 Well, the show must go on, with or without the Rappin’ Cat, and so it will. Sunday night, first pitch at 8:09pm – I will be back with photos! See you there! Not a player was stirring, as the Championship had been sealed. In hopes that a repeat soon would be there. Charlie sprang from the bed to see what was the matter. Having woke from a nightmare of Utley’s speech not getting bleeped. And gave the illusion of a night game on the grass down below. But a miniature sleigh filled with ballplayers, all carrying beer. 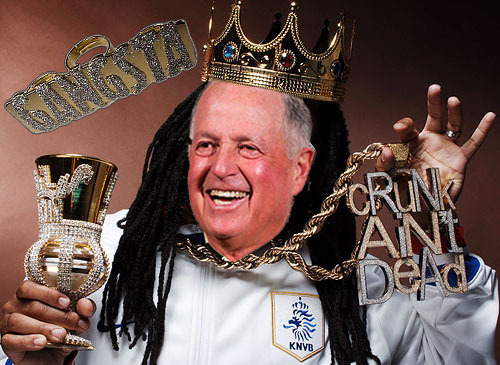 He knew in a moment it must be Pat Gillick. And he grumbled, and shouted, and called them by name! “Now Utley! Now, Howard! Now, Rollins and Feliz! On, Victorino! On, Werth! 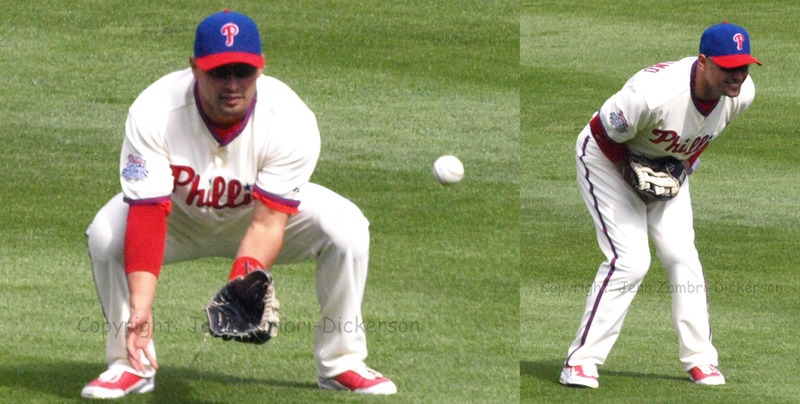 On, Lidge and Ruiz! To the top of the National League! To the top of them all! From the shouting and cheering of each happy fan. Down the chimney Jimmy Rollins came with a bound. And his MVP plaque was all tarnished, with ashes and soot. His much improved hustle, had him right back on track. He filled Charlie’s ears with praise from the mob. As Charlie had delivered and given them proof! Major League Baseball has begun unveiling the winners of the This Year In Baseball Awards. 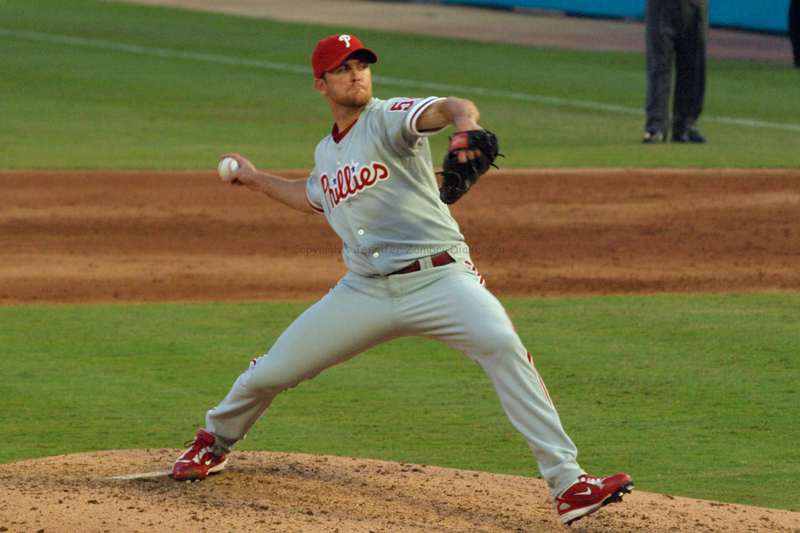 For his perfect season at closer for the Phillies, Brad Lidge walked away with the Closer of the Year Award. Lidge was 41 for 41 in save opportunities during the regular season and 7 for 7 in the post-season, including the Game 5 World Series clincher. For his efforts, Lidge garnered 44% of the vote! The Yankees’ Mariano Rivera came in second place with 22.7%. Pat Gillick, former Phillies GM, was also recognized in the TYIB awards; Gillick won the Executive of the Year award with 31.8% of the vote. Gillick made many moves this past year that many people thought were a bit odd – like the trade for Joe Blanton, bringing in Matt Stairs, etc… – but in the end, these moves paid dividends for the Phils. 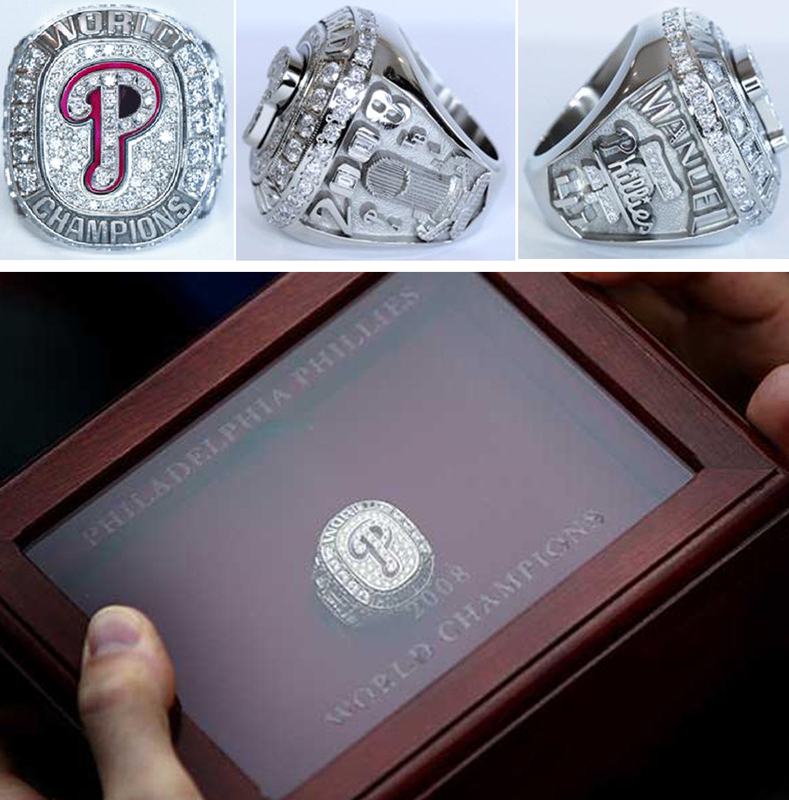 Of course, Adam Eaton is still haunting us…but when you win the big one, all is forgiven :O) Ruben Amaro Jr. has taken over as GM for the 2009 season, but Gillick will remain with the Phillies in an advisory capacity.